EVANSTON, Ill. (WLS) -- Evanston police are looking for the people behind four paintball attacks that all occurred on October 19. Police said the incidents all occurred within a 13 minute span, between 7:20 p.m. and 7:33 p.m.
At 7:20 p.m. a 45-year-old woman was getting out of her car in the 1000-block of Dodge Avenue with her child when she was struck by two paintballs fired from a passing car. Five minutes later, in the 900-block of Ashland Avenue, police said a dark-colored car drove past four juveniles and fired an unknown kind of air gun at them. One of the juveniles was struck but not injured and refused medical treatment. Police could not find any projectiles at that scene. At 7:30 p.m., a 48-year-old man and 37-year-old woman were walking in the 1600-block of Emerson Street when they a white, four-door vehicle drove by and fired paintballs at them. Both were struck; the man was struck in the left eye and was taken to Evanston Hospital to undergo surgery for his injury. At 7:33 p.m. 45-year-old man was riding his bicycle on Asbury Avenue near Dempster Street when a white vehicle drove by and fired paintballs at him. Police said he was struck in the torso and refused medical treatment. Police are trying to collect any surveillance footage of those locations and are asking for the public's help. 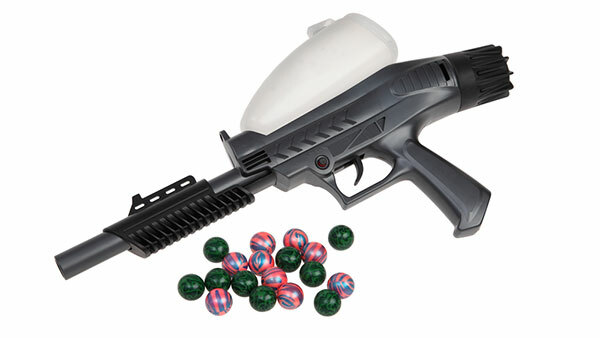 If you have any information about the people who may be driving around in a white vehicle with a paintball gun, contact Evanston police at 847-866-5040.